WAVES/USD is trapped within a tight range bound between $1.77 and $2.42. WAVES/BTC is currently being supported by a downside 1.272 Fibonacci Extension level priced at 29,773 SATS. Support moving forward: $1.77, $1.50, $1.09. Resistance moving forward: $2.00, $2.45, $3.00, $3.12, $3.29, $3.53, $4.00, $4.32. Waves has seen a small price decline totaling 0.57% over the previous 24-hour trading session. At the time of writing, Waves is trading at a price of $1.95 on exchanges, after undergoing a 10% price drop over the past 30 trading days. The cryptocurrency project is currently ranked 44th in terms of overall market cap value. Waves currently holds a total market cap of $194 million after the 29-month old coin saw a further 27% price decline over the past 90 trading days. Let us continue to analyze price action for Waves from a short term outlook and see how price action has developed. Since our last analysis on Waves, we can see that WAVES/USD has dropped beneath our previously identified support level at the downside 1.272 Fibonacci Extension level priced at $2.4955. The market continued to decline until finding further support at the identified downside 1.414 Fibonacci Extension level priced at $1.77 during August 2018. Since reaching reaching this support level, the market has reversed and proceeded to trade within a sideways trading condition. It has been bound between $2.49 as the upper boundary of the range and $1.77 as the lower boundary of the range. Price action is currently trading in the middle of the range as the bears battle the bulls to keep price action beneath the $2.00 handle. If the bulls regather momentum and push the WAVES/USD market above resistance at the psychological round number resistance at $2.00, they will encounter further resistance higher at the upper boundary of the range at $2.49. The upper boundary of the range will require significant momentum to break above due to the 100-day moving average trading directly within this price level. 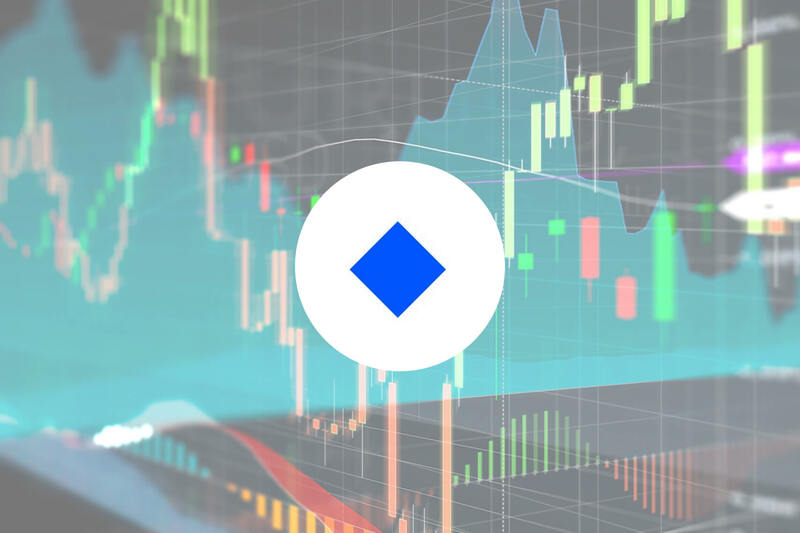 If WAVES/USD price action can climb above the resistance around $2.49 and continue higher, more resistance above can be located at the 1.272 and 1.414 Fibonacci Extension levels (drawn in blue), priced at $3.12 and $3.29 respectively. It is important to highlight that the resistance at $3.29 is further bolstered due to it being a major support level for the market during April 2018 (previous support now turned into new resistance). The bulls will reach further higher resistance at the 1.618 Fibonacci Extension level (drawn in blue) priced at $3.53 if their momentum can break above $3.29. Alternatively, if the bears re-enter the market and push price action lower, we can expect immediate support below at the psychological round number handle at $2.00. If they break beneath $2.00, more support below will then be expected at the lower boundary of the trading range priced at $1.77. In the case that the bearish pressure penetrates below $1.77, traders can look for further support below at the $1.50 handle, followed by the medium-term downside 1.272 Fibonacci Extension level priced at $1.09. The RSI technical indicator within the market is currently favoring the bears as it trades beneath the 50 handle. For a sign that the bearish momentum is fading, we will look for the RSI to re-approach the 50 handle and break above it. Let us continue to gather more information about the market by analyzing price action for Waves relative to BTC over the long term and analyze market action. Assessing the WAVES/BTC market from the long-term perspective above, we can immediately notice that the previous downward pressure had met a halt during August 2018 at a downside 1.414 Fibonacci Extension level priced at 24,051 SATS. As the market reached this level, the bulls began to battle to stop the market from pushing lower. Price action then went on to rally higher until finding resistance at the 100-day moving average level. Price action is now trading at support provided by the downside 1.272 Fibonacci Extension level priced at 29,773 SATS. Let us continue to analyze price action a little closer and highlight any potential support and resistance areas. Evaluating the market from the benefit of a closer perspective above, we can see that price action had experienced a price surge. The market began from a low of 29,926 SATS on August 4, 2018 and extended to a high of 43,774 SATS on September 10, 2018. This was a total price increase of 85% from low to high. After reaching the high, we can see that price action has now rolled over and started to decline. Price action is now resting at support provided by the long-term downside 1.272 Fibonacci Extension level (drawn in blue), priced at 29,773 SATS. 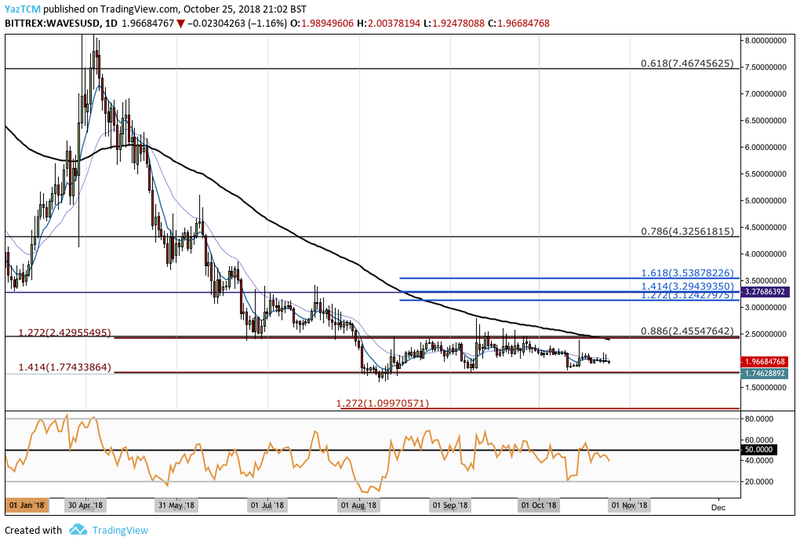 Price action has been trapped within a well-defined range for October, bound between the .5 Fibonacci Retracement level priced at 33,729 SATS as the upper boundary of the range and the support at 29,773 SATS as the lower boundary of the range. If the bearish pressure persists and pushes price action below 29,773 SATS, we can expect further support beneath to be located at the .786 and .886 Fibonacci Retracement levels, priced at 27,996 SATS and 25,992 SATS respectively. If price action dips even further lower, more support below can then be expected at the long-term downside 1.414 Fibonacci Extension level priced at 24,051 SATS. On the other hand, if the bullish momentum regroups and pushes price action above the upper boundary of the range at 33,729 SATS, they will encounter more resistance above at the .382 Fibonacci Retracement level priced at 36,094 SATS. If the bullish momentum carries the market further higher, more resistance above will be located at the 1.272 and 1.414 Fibonacci Extension levels, priced at 40,611 SATS and 42,518 SATS respectively. The RSI technical indicator is also producing readings which favor the bears at this moment in time. If we are to see positive price action for WAVES, we will need to watch the RSI break above the 50 handle.